This guide will explain how to pair a bluetooth barcode scanner with MobiPOS application. In MobiPOS, scanning barcode can be used to retrieve transactions or product items. User will need a bluetooth barcode scanning device which is compatible with iOS. To use this feature, user will first need to pair the bluetooth barcode scanner with the iPad. 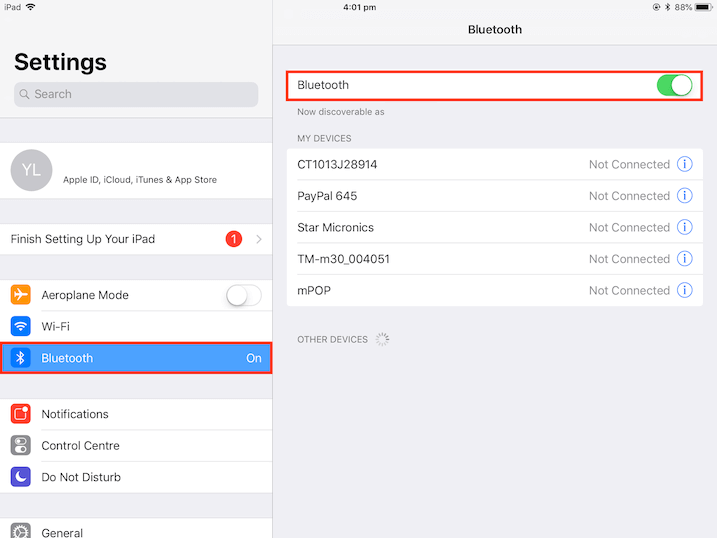 To pair the device, go to iPad Settings -> Bluetooth. Turn on bluetooth and look for device that is listed. Choose the barcode scanner that is shown in the list and proceed to pair. Different barcode scanner has different pairing procedure, you should follow user manual that is included by the barcode scanner manufacturer. If pairing is successful, user can first test it with Notes app in iPad. Open the Notes app then scan any barcode with barcode scanner. Barcode scanner acts as a keyboard, upon scanning the barcode, the barcode number will be shown on the notes. If it shows correctly, scanning should work in MobiPOS as well. 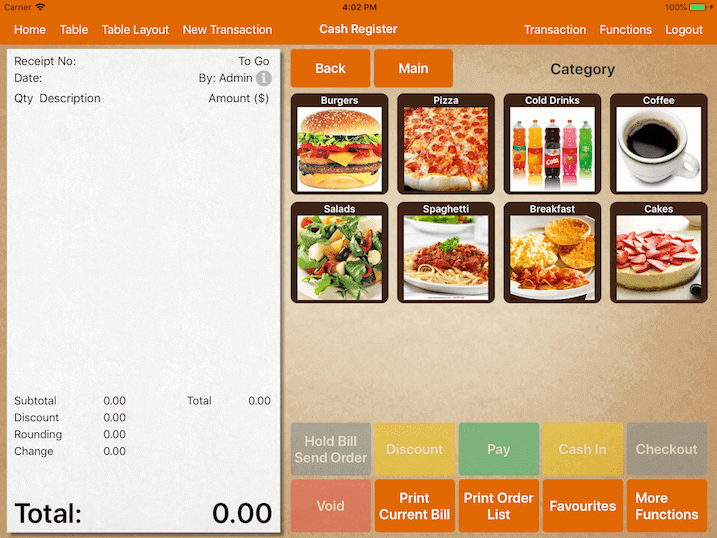 To use this feature with MobiPOS, user has to be in Cash Register screen. 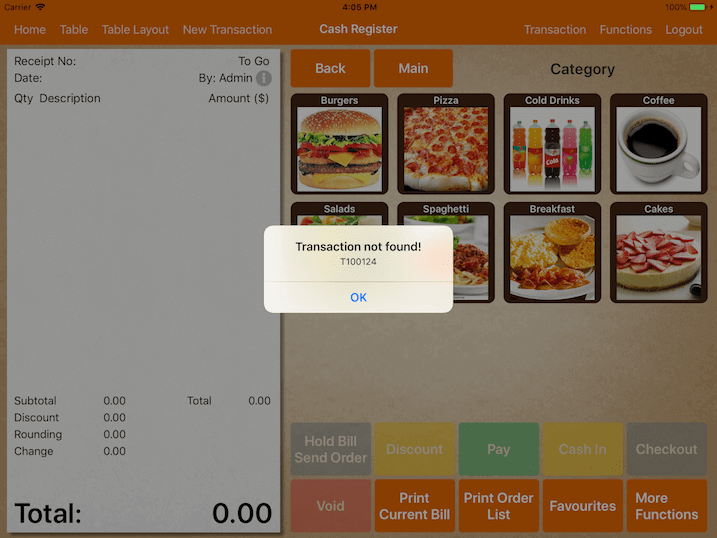 At this screen, make sure no pop up is shown, user can scan any transaction receipt or item's barcode. If barcode is found, order will be added to receipt automatically. If order requires further attention for example entering weight or selecting modifier, it will show accordingly. User can also attach/connect a bluetooth keyboard to the iPad, then enter the barcode number on the keyboard instead of using bluetooth barcode scanner. Upon entering the barcode number, press "return/enter" key to activate the search. 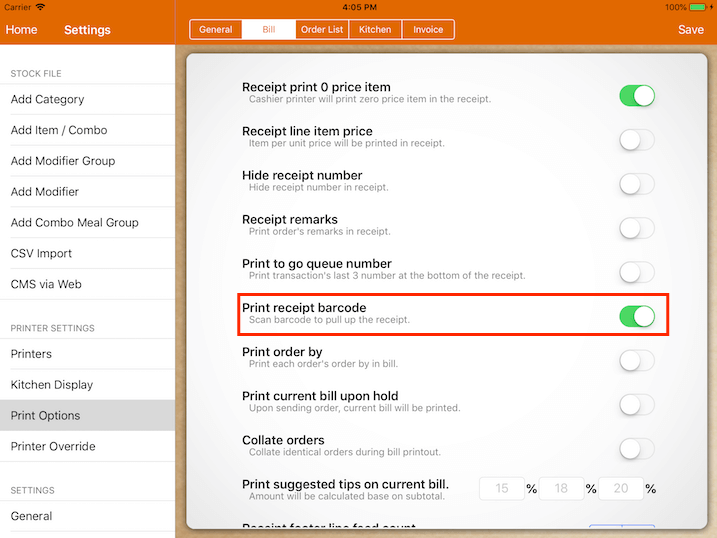 To enable the scanning of barcode to retrieve transaction, go to Settings -> Print Options -> Bill, then turn on the Print Receipt Barcode switch as shown below. Upon switching on the option, each receipt printed will have a barcode shown at the footer. When the barcode is scanned, receipt information will be retrieved. In case where the barcode scanned is not found in the system, it will show an error as shown below. There are two operating modes of the scanner, HID mode and iOS mode. iPad's on-screen keyboard feature will be disabled when the barcode scanner device is paired. In order to enable the keyboard again, user will need to eject or turn off barcode scanner device. However, it depends on the type of barcode scanner device used. Different device might require different method to pop the keyboard. Scanner set to iOS mode will not interrupt or override the iPad's on-screen keyboard. It allows user to scan barcodes and QR codes without disabling iPad's on-screen keyboard. To change from HID mode to iOS mode, follow the guidelines provided by manufacturer. * MobiPOS works only with HID mode. * If you are using Socket scanner, scanner has to be in basic mode.